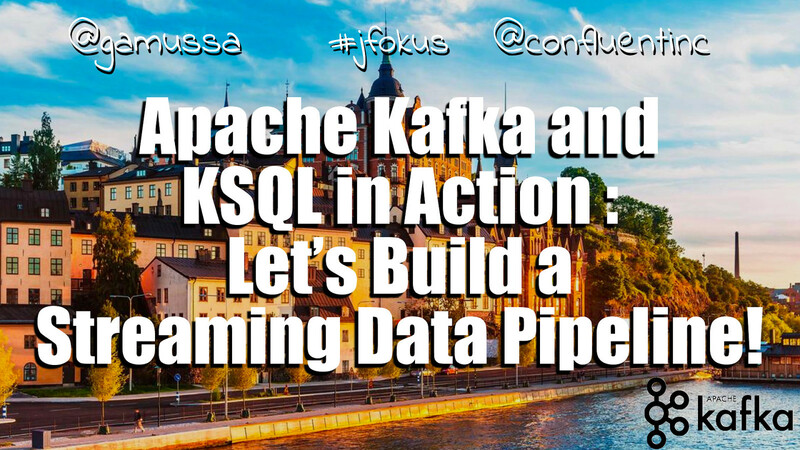 @gamussa #jfokus @confluentinc Apache Kafka and KSQL in Action : Let’s Build a Streaming Data Pipeline! Do you think that’s a table you are querying ? View Apache Kafka and KSQL in Action: Let’s Build a Streaming Data Pipeline!. Have you ever thought that you needed to be a programmer to do stream processing? Think again! Apache Kafka provides low-latency pub-sub messaging coupled with native storage and stream processing capabilities. Integrating Kafka with RDBMS & other data stores is simple with Kafka Connect. KSQL is the open-source SQL streaming engine for Apache Kafka, and makes it possible to build stream processing applications at scale, written using a familiar SQL interface. In this talk well explain the architectural reasoning for Apache Kafka and the benefits of real-time integration, and well build a streaming data pipeline using nothing but our bare hands, Kafka Connect, and KSQL. You’ll learn how to use SQL statements to filter streams of events in Kafka, join events to data in RDBMS, and more.